Olivia Cleans Green: How Natural is Your Nail Polish? Considering how nauseating the experience of just walking past a nail salon can be, it shouldn't be surprising that nail polishes and removers usual contain toxins. What is surprising is that many nail products marketed as "natural" also contain known toxins. This Spring investigators with the California Department of Toxic Substances Control found dibutyl phthalate, toluene, and formaldehyde, commonly called “the toxic trio,” present in several of 25 randomly chosen nail polishes that claimed to be natural. Frugivore recently reported on "5 Toxic-Free Nail Polishes for Healthy Style." Have you tried any? Nail polish isn't something I use or think about often. As I am always working with my hands, polish seems to stay chip-free for only a day or two at most. Also nail painting seems like a complete waste of time, money, and body burden points. LOL! Still, sometimes I paint my toe nails because they are seriously gnarly. 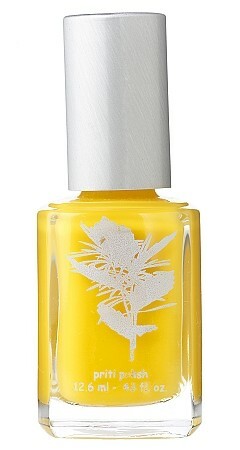 When I do I use Priti polish, which I discovered while working at Sustainable NYC. The brand has great colors. Plus, I am in love with their nail polish remover. It's absolutely non-drying. In fact, it leaves my nails feeling healthier! I only wish it didn't contain fragrance. Priti polish in "Baby Toes Cactus." I love this color! Tip: It's on sale because it's discontinued! I've heard good things from parents about Piggy Paint too. It's marketed to kids and claims to be free of formaldehyde, toluene, phthalates, Bisphenol A, ethyl acetate and acetone. I'm not sure why the website acts like only girls use it. I've seen several little boys flip out over nail polish! Why can't they have fun too?